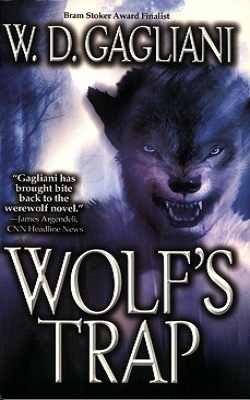 Wolf’s Trap is the story of Nick Lupo. He’s a good cop with an unusual secret. Nick is a werewolf and even after many years, he is still trying to come to terms with that fact and learn how to control the animal within him. Nick may be a werewolf, but he’s in control of the situation and isn’t a danger to anybody. Most of the blood spilling in Wolf’s Trap is done by a serial killer. Nick doesn’t know it, but the killer he is hunting is also hunting him. What Nick does quickly come to realize is the killer might be the one person in the world who knows his secret; so Nick needs to figure out the killer’s identity, and also how the killer knows so much about him. As far as serial killers go the one in this book is a little different. He has unusual tastes and an unhealthy obsession with lipstick. He’s a strange guy, he’s a dangerous guy, and he is working to a plan. When Nick and his partner, Ben, are brought in to investigate the death of a young prostitute found mutilated in a public toilet, Nick discovers the victim was his friend and neighbour, Corinne Devereaux. This is a terrible shock for the young detective because although he and Corinne were just good friends he cared about her deeply, perhaps more than he ever realized. It’s too late now. The killer’s knife has closed that particular avenue of thought forever. The other cops, with the possible exception of Ben, put this down to the work of Satanists. “Nick’s another name for Satan—you know, Nick Scratch,” a forensics tech tells him. “Yeah,” Nick says, but he knows better. I have not read a lot of werewolf novels. In fact, I think that Wolf’s Trap is only the second one. Because of this, I cannot say how Wolf’s Trap does or does not compare to other similar works, but I can say that I enjoyed it. Wolf’s Trap is a well crafted and interesting story with a lot happening. The main story concerns Nick’s hunt for the killer. But there is also the back story of what happened to Nick to make him what he is, along with his ongoing work to exercise some kind of control over his change and over the beast within. The book also contains the killer’s story, and a little of what, perhaps, contributed to the way that he is. Then there is a touch of romance, because not all of Nick’s needs are animal. Like anyone else, he needs love, but with a killer on his tail (figuratively speaking) he might be a dangerous person to be around. Wolf’s Trap is 373 pages long and I think that the best way for me to describe it would be to say that it is crime story where the main character just happens to be a wolf in cops clothing. It is a book that a lot of readers might enjoy, not just horror fans. If you are a horror fan, however, I should point out that book was a finalist for the 2003 Bram Stoker Award, which should, I think, say it all.